Buffers of audio were captured from the device microphone (using PyAudio) and processed individually (using Librosa). Each audio buffer was then used to extract a chromagram (12 dimensional representation of the folded energy across octaves for each chromatic note). 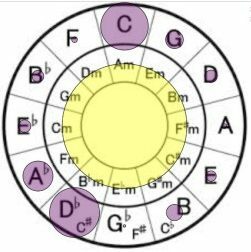 I then continued to match the chromagram to common chord template chromagrams to predict the Chord Name that was being played. As a guitar player I wanted a tool to quickly tell me the names of the chords I played at my browser . Here is a screenshot of the browser as I played a Cmaj chord on my guitar. Will upload an interactive browser based demo soon.